The Benefits of Focusing can be felt by everyone who is drawn to a deeper understanding of themselves, their purpose, and the expression of their gifts. Are you an individual or a couple who wants to live a more authentic life, but are struggling with issues that keep you stuck? Or, are you a therapist or healing professional who wants to learn how to help your clients get in touch with their calm, clear center during the most stressful time? Focusing is a skill that can add tremendous value to your life and livelihood. Focusing points toward a new awareness where real change happens. Learning Focusing can be one of the most nourishing and life-giving gifts you can give yourself. Turn to your body as an ally and friend. Quiet self-criticism and activate your capacity for inner guidance. Change and improve your relationship with yourself and others. Keep company with all your feelings, without fear of being overwhelmed or hijacked by them. Reduce the effects of stress on the body and in your work and personal life. Improve communication, self-confidence, and self-esteem. Help you make good decisions and strengthen your creative work. Understand what you truly feel and want. Surmount obstacles, make decisions, and solve problems creatively. Find relief from tension and chronic pain. Deepen and increase the effectiveness of counseling and psychotherapy. 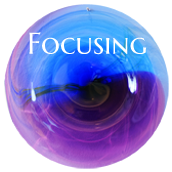 Focusing has proven successful over decades of development and is supported by cutting edge neuroscience. Focusing goes beyond simply being with sensations. It helps you become present to and interact with your bodily sensed experience in ways that allow your stuck places and trauma to unwind and heal. Help clients become present to their experience so they can observe and interact with it. Identify different client processes such as being blocked, self-criticism, indecision and what to do with each. Help clients regain a sense of trust in their bodies so they know what they feel and want. Work effectively with eating and dieting. Learn to sense and use your own ‘felt senses’ in sessions to move therapy along. 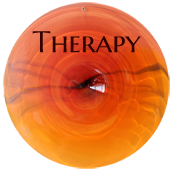 Discover how Focusing helps you ally with your clients so the therapeutic relationship deepens. Listen in ways that help clients open up about “seemingly” unrelated issues. Learn how to keep clients from feeling overwhelmed or shutting down. 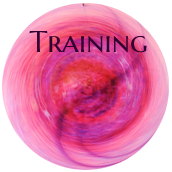 Learn how to work safely with complex trauma so that it unwinds and resolves. Discover how much easier it is to work in a way in which clients naturally take control of the session and make change steps more smoothly. Enjoy the benefits of working long term with clients for deep, lasting change. 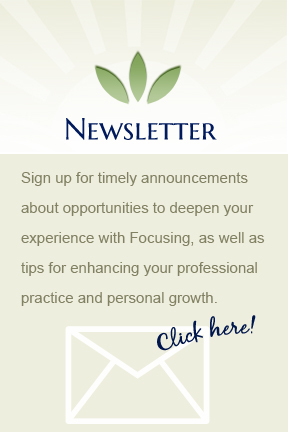 I offer several ways that you can experience the power of Focusing: Individual Guided Sessions, Focusing-Oriented Therapy, and formal Focusing Training for Therapists and Healing Professionals.